As promised, here is a picture of the Tuesday View under the snow! It is very frosty, so I didn’t stay out for long with my camera. But here are a couple of other images from today too. 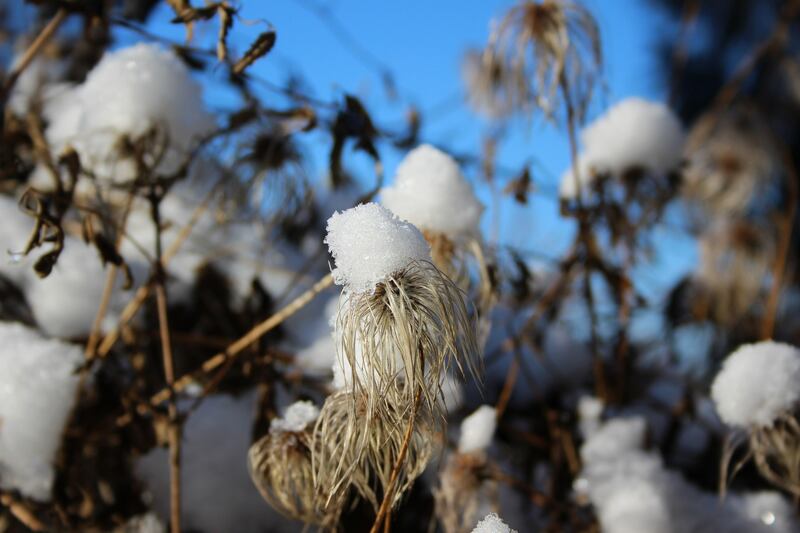 Clematis tangutica – a tangle of stems with straggly seed heads, but the snow makes them seem quite comical! Hope you have blue skies this week, wherever you are! This entry was posted in Garden, Tuesday View and tagged Garden, Nature, Seasons, The Tuesday View, Winter. Bookmark the permalink. We have blue skies and freezing temperatures, a severe frost last night, but sadly no snow! The whole of France is under nature’s icy grip this week! We were lucky to get the snow just before it started to freeze again, so now everything is clean and white and frozen solid! Hope your freeze comes to an end soon. It’s lovely Cathy although I can understand when you say you can have too much white for too long! 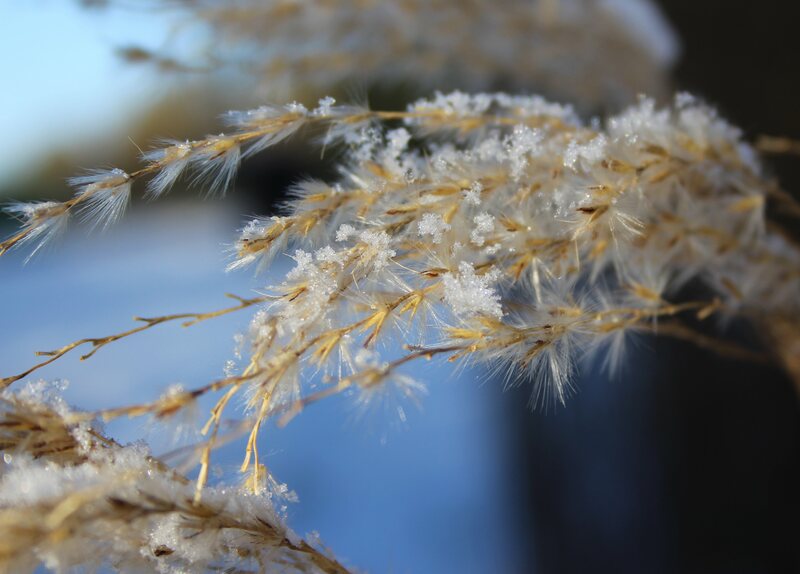 The Miscanthus is gorgeous; they are a fabulous grass. Keep warm. Thanks Christina. 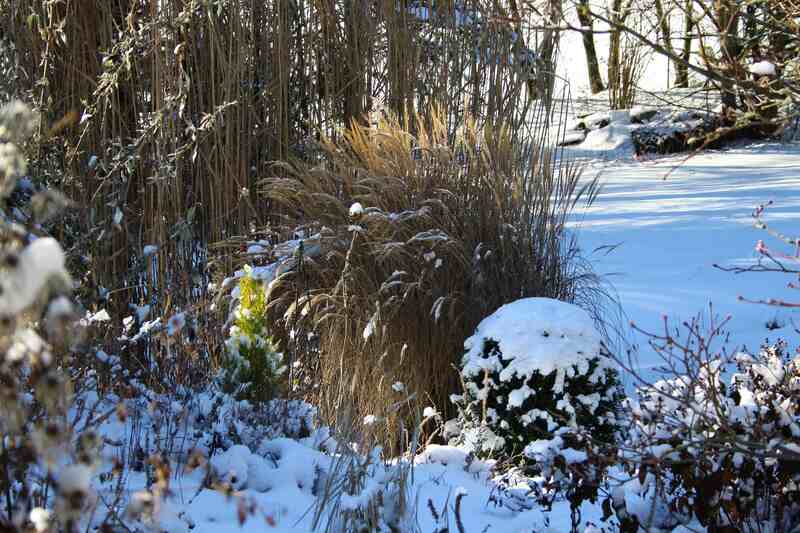 I managed to shake the powdery snow off the Miscanthus, so it didn’t get too squashed! Snow always seems so magical. We have been close to 80F with thunderstorms and tornadoes on the Gulf Coast. Goodness, tornadoes must be so frightening. Hope your weather calms down a bit too! It seems some areas of the UK got an awful lot of rain with the last storm that passed over. Let’s hope calmer and milder weather sets in soon! The snow certainly makes for a big change in your view. Wow! Thanks for braving the cold for a few pictures, Cathy. It’s amazing seeing your garden under all that snow. We only got a few centimetres of snow – nothing compared to some parts of the country. Still, the ski resorts in the Alps are happy now! The same is true here for the ski resorts. And to ski the Alps…be still my heart. I’m not a skier, but I remember the beauty when I rode the train through parts of Germany and Switzerland. Breathtaking. You are so right. The snow in the garden still looks fairly white and sparkly, but in the towns it is turning grey and ugly already. I don’t mind the dry cold weather really – it’s the damp wet of a thaw I dislike, revealing mouldy stems and garden debris! Loved seeing your snow-covered garden, Cathy. It won’t be long before it is growing again. I like to think about your perovskia and fairy roses. My IAVOM yesterday had a glimpse of my dormant garden, but it’s not as pretty as yours. 🙂 Sadly, the snow always flattens my Miscanthus, but my Astilbe still looks good. I love seeing your border in the snow – there’s such wonderful light from the snow 🙂 And your Clematis tangutica are darling in their snow hats! I do hope it gets milder for you soon though! We have had lots of sunshine the last few days making it more photogenic than on a grey day! Beautiful photos, lovely to look at from the right side of the window. 😉 Yes, I haven’t spent much time outdoors recently! 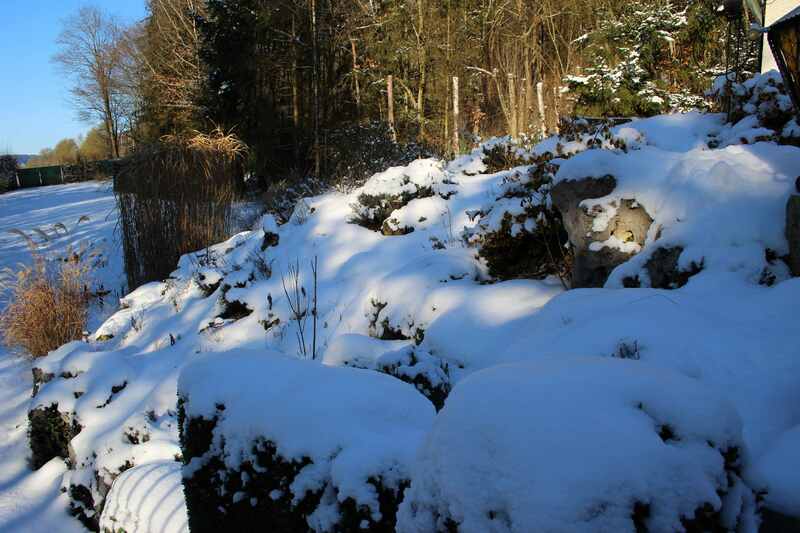 Love that last photograph – all our snow has melted for now! Our snow seems to be sticking around for a while as the freeze continues..